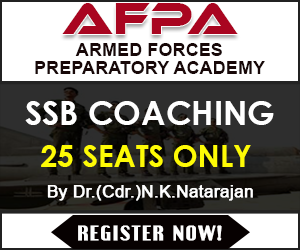 Candidates who are looking for the list Indian military exercises and training events conducted in 2018 can get the complete list of joint military exercises of Indian army, navy, airforce and coast guard held in 2018 with friendly nations. 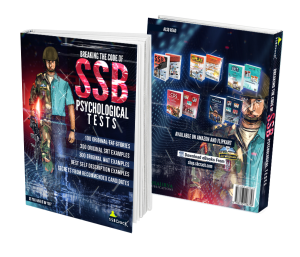 List of military exercises will help you in the competitive exams, job and SSB interviews. 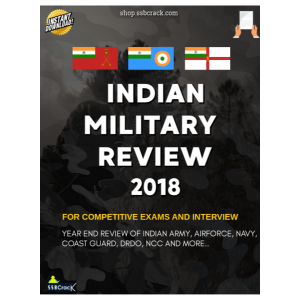 Candidates who are interested in knowing more about the achievements of Indian Army, Navy, Airforce, Coast Guard, DRDO, NCC etc can download the Indian Military Review 2018 ebook from SSBCrack. 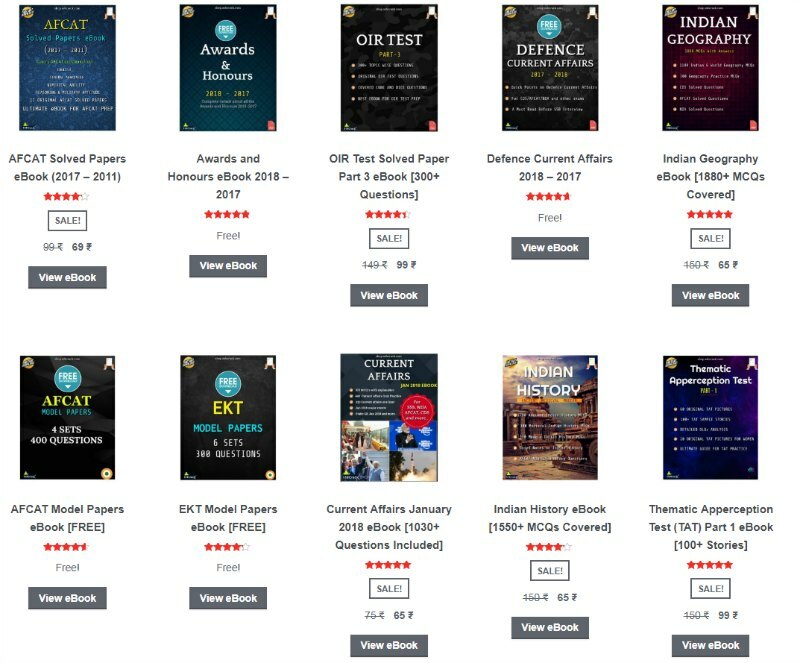 This ebook will help you to understand the various events and achievements of Indian Armed Forces in 2018.
lndo-French Joint Military Exercise: lndo-French joint military exercise was conducted at Mailly Le Camp, France from January 28 to February 04, 2018. The aim of the exercise was to acquaint both forces with their operating procedures for counter insurgency and counter terrorism operations under UN mandate. lndo-Malaysian Joint Military Exercise: The first ever joint exercise between Indian and Malaysian armies ‘HARIMAU SHAKTI – 2018’ was held from April 30 to May 13, 2018 in the forests of Sengai Perdik Hulu Langat, Malaysia. 4 grenadiers from Indian Army and 1 Royal Ranger Regiment and Royal Malay Regiment participated in the exercise. The first ever such exercise between the two countries aimed at training of troops in counter insurgency operations in jungle terrain. It has laid the groundwork for future editions. lndo-Nepal Joint Military Exercise: ‘SURYA KIRAN – XIII’ was conducted in Pithoragarh, Uttarakhand from May 30 to June 12, 2018. The battalion level exercise focused on counter terrorism operations in mountainous terrain. lndo-Thailand Joint Military Exercise: lndo-Thai Joint Military Exercise ‘MAITREE’ was held in Thailand from August 06-19, 2018. The exercise was aimed at training the troops in counter insurgency & counter terrorism operations under the United Nations mandate. Both sides jointly trained, planned and executed a series of well-developed tactical drills for neutralization of likely threats that may be encountered in urban warfare scenario. Multinational Joint Military Exercise SCO Peace Mission 2018: India participated for the first time in the fifth edition of the joint multinational military exercise SCO Peace Mission between August 24-29, 2018. The joint exercise exhibited the combat power and dominance of the participating armies over extremist groups in simulated realistic situation. lndo-US Joint Military Exercise: The 14th edition of lndo¬ US Joint military Exercise ‘YUDHABHYAS 2018’ was conducted at Chaubatia, Uttarakhand from September 16 to 29, 2018. The two week-long event saw both the armies hone their tactical and technical skills in countering insurgency and terrorism in a UN peacekeeping scenario involving a combined deployment at a brigade level. The Indian contingent was represented a battalion from Garud Brigade, Surya Command while the US contingent was from 1st Infantry Battalion of 23 Infantry Regiment, 2 Stryker Brigade Combat Team and 7 Infantry Division. lndo-Kazakhstan Joint Military Exercise: The third edition of joint military training exercise between Indian Army and Kazakhstan Army was held at Otar Military station, Kazakhstan. Ex KAZIND 2018, a 14 day long joint exercise was conducted from September 10 to 23, 2018. The Kazakh contingent was represented by Military Base 85395 while the Indian side was represented by 5 Ladakh Scouts Regiment. Both sides jointly trained, planned and executed a series of well developed tactical drills for neutralisation of likely threats that may be encountered in urban warfare scenario. Multinational Joint Exercise of BIMSTEC Nations: Military field training exercise for BIMSTEC nations, MILEX-2018, was conducted between September 10-16, 2018. Aaim of the exercise was to collectively train BIMSTEC nations in planning and conduct of counter terrorist operations in a semi urban focus of the exercise was to train and equip the contingents to undertake joint counter insurgency and counter terrorist operations in urban and semi-urban terrain. Training contingents comprised of platoon strength from 1st Gorkha Rifles of the Army and 32 Regiment from Japanese ground Self Defence Forces. lndo-Japan Joint Military Exercise: The first of its own kind, an lndo-Japan joint military exercise DHARMA GUARDIAN 2018 was conducted at CIJWS, Vairengte from November 01 to 14, 2018. The primary aim was to in and equip the contingents undertake joint counter insurgency and counter terrorist operations in urban and semi urban terrain. The training contingents comprised of platoon strength from 1st Gorkha Rifles of the Indian Army and 32 Regiment from the Japanese ground Self Defence Forces. lndo-Russia Joint Military Exercise: Tenth edition of lndo-Russian joint military Exercise INDRA was conducted at Sabina Military station from November 18 to 28, 2018. The aim of the exercise was to practice joint planning and conduct to enhance interoperability of the two armies in peace keeping and enforcement environment under the aegis of United Nations. lndo-Maldives Joint Military Exercise: Ninth edition of lndo-Maldives joint military exercise EKUVERIN 2018 was conducted at Maafilaafushi, Maldives between December 14-29, 2018. The Indian Army contingent comprised of officers and troops from the MADRAS Regiment while Maldives was represented by officers and marines of MNDF. The primary focus of the exercise was to train and equip the contingents to undertake joint counter insurgency and counter terrorist operations in rural/ urban environment. Officers’ Training Academy, Chennai training Afghan lady officers: As part of a continued effort of training being imparted by the Army to women officers from abroad, the women officers of the Afghan Army and Air Force were trained on basic military aspects including physical training, weapon training, tactics, communication skills and leadership at OTA, Chennai from November 26 to December 22, 2018.
lndo-China Joint Military Exercise: 7th Sino -India joint exercise Hand-in-Hand 2018 was held from December 10 to 23, at Chengdu, China. Company size contingents of 11 SIKHLI from Indian Army and a regiment from Tibetan Military District of People’s Liberation Army participated in the exercise. The Indian contingent was led by Col Puneet Pratap Singh Tomar, Commanding Officer, 11 SIKHLI, while the Chinese contingent was led by Col Zhou Jun. The exercise will consist of a balance of indoor classes and outdoor training activities: The aim of the exercise is to build and promote close relations between armies of both the countries and to enhance ability of the joint exercise commander to take military contingents of both nations under command. The exercise will involve tactical level operations in an international counter insurgency/counter terrorism environment under UN mandate. Ex Gagan Shakti:IAF conducted PAN India Exercise Gaganshakti 2018 between April 08-22, 2018. The aim of the exercise was real time coordination and employment of air power in a short and intense battle scenario. A major highlight of the exercise was a very high availability and reliability of all combat assets including aircraft, missile systems and radars. High tempo operations also enabled the IAF to ascertain sustainability of the logistics chain. Ex Pitch Black-2018(OUT EX): Ex Pitch Black (Ex PB) is a biennial exercise conducted by Royal Australian Air Force. Ex PB-18 was the inaugural exercise for IAF conducted from Jul 19 to August 18, 2018, at Darwin, Australia. IAF participated with 04 x Su-30MKI, 01 x C-17 and 01 x C-130J aircraft along with 145 IAF personnel. Hop exercise was conducted at Subang, Malaysia during the transit to Malaysia. International Army Games-2018 (OUT EX): Two observers (each) represented IAF in “UAV Competition” at Kazakhstan from 06-08 Aug 18 and in “Ex Aviadarts (Air to Ground firing competition)” at Russia from August 03-04, 2018. Ex Aviaindra-2018 [Phase-I (IN Ex) & Phase-II (OUT Ex)]: The exercise was planned in two phases. Phase-II was held at Lipetsk, Russia between September 17-28, 2018 and Phase-I was held at Jodhpur, India from December 10-21, 2018. Russian IAF participated with 30 members during the exercise. 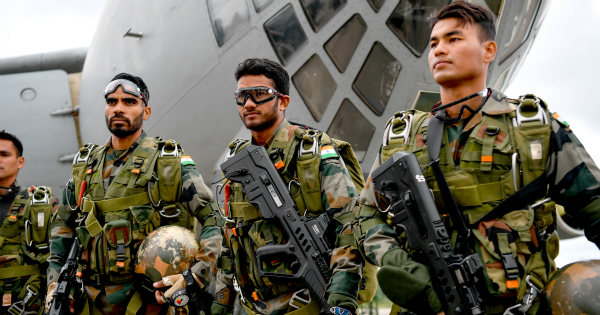 Ex Cope India-18: United States Air Force and Indian Air Force participated in an exercise, ‘Cope India’. It was conducted at Kalaikunda and Panagarh from December 03-14 18. USAF participated with 12X F15 C/D and 03XC-130. Observers from Japan Air Self Defence Force also participated in the exercise. Western Fleet (WF) Overseas Deployment (OSD): Western Fleet ships comprising Mumbai and Trikand were deployed for Western FleetOverseas Deployment from April 15 to May 23, 2018. During the deployment, the ships along with P8I aircraft participated in Phase III of EX-VARUNA, at/off Reunion Island, from May 01-07, 2018. Western Fleet ships comprising Kolkata and Trikand participated in exercise IBSAMAR at Simons Town, South Africa from October 01-13, 2018. Malabar 18 and RIMPAC: Eastern Fleet ships comprising Sahyadri, Kamorta and Shakti were deployed for Eastern Fleet Overseas Deployment. The ships along with P8I aircraft participated in Exercise Malabar at Guam. On completion of Malabar 18, Kamorta and Shakti returned Visakhapatnam on July 07, 2018. Sahyadri thereafter participated in exercise RIMPAC at Hawaii and Kakadu at Darwin and finally arrived at Visakhapatnam on September 29, 2018.
International Fleet Review at Jeju: Eastern Fleet ship INSRana was deployed for Eastern FleetOverseas Deployment from September 17 to November 24, 2018. The ship participated in International Fleet Review at Jeju, South Korea between October 08-15, 2018. The ship participated in IND-INDO Bilateral exercise at Surabaya, Indonesia from November 12-16, 2018. Overseas Deployment of 1 Training Squadron (1TS): Ships of 1 Training Squadron consisting of IN Ships Tir, Sujata, Sudarshini, Shardul and ICG Ship Sarathi were deployed in South-East Asia as part of training deployment from September 20 to October 22, 2018. The ships visited Lumut, Malaysia, Singapore and Jakarta, Indonesia. During the deployment IN ships Tir, Sujata and Shardul were diverted off Palu, Indonesia, to provide relief assistance to the Tsunami affected Island of Sulawesi. Indian Coast Guard is the national coordinating agency for maritime search and rescue in the vast 4.6 million square kiolometres of Indian Search and Rescue Region. Director General Indian Coast Guard is the Chairman of National Maritime Search and Rescue Board which is responsible to coordinate M-SAR related matters. Distress Beacon Exercise: In order to enhance efficacy of M-SAR construct, series of Beacon exercises are being conducted. The 14th and 15th exercise was conducted on May, 23-25 and September, 26-28, 2018 respectively. Active participation was witnessed from Defence and Civil and a total of 96 beacons were tested in 2018. National Maritime Search and Rescue Workshop & Exercise (SAREX-18) conducted between January 16-17, 2018 off Chennai. The SAR exercise was in series of the biennial exercise conducted by ICG. Regional Maritime Search and Rescue Exercise Mar 19 & 21, 2018 off Port Blair, Andaman and Nicobar Islands. Maritime SAR Workshop & Interactive Sessions: Under the aegis of NMSAR Board, ICG took the initiative of conducting Maritime SAR Workshop & interactive session for mariners, fisherman and stake holders. These initiatives were aimed towards building up a collaborative approach for strengthening safety of fisher-folks and mariners and enthusing safety consciousness among coastal communities. SAR Communication Exercise:With a view to reinforce our operational linkages with leading Maritime SAR service providers in the Indian Ocean Region, MRCC (Mumbai), MRCC (Chennai) and MRCC (Port Blair) conducted Search and Rescue Communication Exercises (SARCOMEX) with friendly countries in the year 2018, that include Oman, Bangladesh, Indonesia, Malaysia, Qatar, South Korea, Vietnam, Sri Lanka, Myanmar, Australia. XVII National Maritime Search and Rescue (NMSAR) Board Meeting.The XVII National Maritime Search and Rescue (NMSARB) meeting was held at Vigyan Bhawan Annex, New Delhi on Jul 05, 2018 under the chairmanship of Director General, ICG and Chairman, National Maritime Search & Rescue Board, Shri Rajendra Singh.The meeting was attended by all the board members alongwith other special invitees alongwith Fisheries department representatives from five States. Various issues related with safety of fishermen and mariners were reviewed and discussed. During the meeting annual NMSAR awards were also distributed by the Chairman, NMSAR Board. The ‘ICG SAR Award for Fisherman’ was awarded to Shri Milan Shankar Tare, Owner & Master of fishing boat ‘Dharti’ for saving 12 lives from sinking fishing boat ‘Shivneri’ 33 NM off Tarapur, Maharashtra.